When Rudy Gobert was ruled out for a month with a bone bruise in his right knee back on November 11, the Jazz became an afterthought in the crowded Western Conference. The thinking—my thinking, at least—was that Utah’s strong defense would slide without Gobert around to anchor the middle, and for an already offensively challenged team, that would spell death. It has not spelled death. The Jazz are currently riding a five-game win streak following last night’s home win over the Pelicans. The Pelicans are exactly the sort of team you’d expect to pound the poor undermanned Jazz sans Gobert—with just Derrick Favors and the delightful Ekpe Udoh to man the interior, New Orleans big men Anthony Davis and DeMarcus Cousins would rampage, and Utah’s punchless offense would fall behind, and that would be that. Mitchell’s shot distribution as an NBA player is downright James Harden-ian: on the season, he’s attempted 245 total shots from the restricted area and from beyond the arc, against just 96 total attempts from either the mid-range or the non-restricted-area part of the paint. This distribution reflects all of the following: that Donovan Mitchell has a gorgeous jumper and is comfortable launching from Ryan Anderson range; that he is also a twitchy athlete and an explosive leaper who can get the ball to the rim through and over and around contact in the paint; and that he is disciplined enough to chase the most valuable shots in basketball while avoiding less efficient areas of the court. Over the 11 Jazz games since Gobert went down, Mitchell’s play time has increased to about 32 minutes per game. 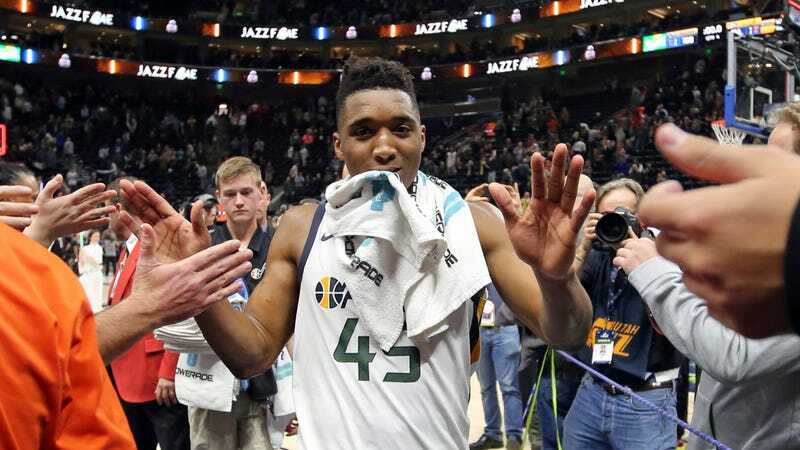 Nothing of what I am about to show you should be coming from a rookie playing starter minutes on a veteran-laden, offensively-challenged team: Since Gobert’s injury, Mitchell is giving the Jazz 20 points a game on 58 percent True Shooting, plus 4.5 assists per game, on 28 percent usage. No big deal—the 13th pick in the 2017 NBA draft is already a high-efficiency, high-usage, 20 points-per-game scorer on a playoff team. Ho hum. Because I have already watched it 97 times, I would like to discuss Mitchell’s move at about the 3:00 mark of the third quarter (2:16 in the video above). He tries to run his defender into a Udoh screen. The defender, E’Twuan Moore, lunges to get over the screen, because, by that point, Mitchell had already punished the Pelicans for going under screens by dropping in a few pull-up threes. Mitchell reacts instantaneously to Moore’s lunge and spins back towards the center of the court, which is exactly where modern NBA defenses don’t want ball-handlers going. Moore is toast, but look at what Mitchell does to Cousins, there: with just one dribble to accelerate Mitchell is on top of him, and darting right into a slick Eurostep move, followed by a gorgeous scoop layup. That’s expert-level pick-and-roll ball-handling. Next time you watch Bradley Beal retreat to half court when his defender fights over a screen like that, I want you to remember Mitchell stringing together reflexive dribble moves, incredible footwork, and blazing quickness to completely eviscerate the Pelicans defense. That’s what I’ll be thinking about, while I am ramming my head into the microwave and frantically mashing down all the buttons. The book on Mitchell as a draft prospect had him pegged as a high-end three-and-D guy. DraftExpress compared him to Norman Powell, projected him as a secondary ball-handler, and warned against using him as a lead guard, due to questions about his feel for the game. My friends, last night, in a real regular season NBA game, the Jazz made him the lead ball-handler for basically the entire fourth quarter of a close game against another playoff hopeful, and all he did was score 17 points in the frame and deliver a damn victory. I don’t know, man. In my giddiest moments, Mitchell looks like a guy with Russell Westbrook’s terrifying athleticism, plus one of the purest jump shots in the NBA, plus the ideal distribution of shots. A lot can go wrong in a player’s career, and Mitchell is just as likely to become Larry Hughes as he is to become an All Star. But Elias says Mitchell is the first rookie to go for 40 points in a regular season game since Blake Griffin in 2011. He didn’t do it by happening to make all of his shots—he did it as the offensive focal point of his team. He did it the way star NBA players do it, by shouldering a star’s load and outclassing the defense, over and over again, all the way until the job was done. Mitchell is a rare specimen, and can already say he spent one night as very definitively the best player on the floor in a game that happened to include Anthony Davis and DeMarcus Cousins. I think he could be a monster.